UNITED NATIONS, December 20 -- As the death of Kim Jong-Il drew signatures in a condolence book in New York including from UN Secretary General Ban Ki-moon's Deputy, Asha Rose Migiro, after a quiet Security Council meeting with virtually no media coverage a critique was made of the Council's sanctions on the Democratic People's Republic of Korea. Inner City Press has learned, and confirmed, that the delegation of Russia, this month's Security Council president, complained that the sanctions are impinging on the work of their "large" embassy in Pyongyang. "Emphasizes that all Member States should comply with the provisions of paragraphs 8 (a) (iii) and 8 (d) of resolution 1718 (2006) without prejudice to the activities of the diplomatic missions in the DPRK pursuant to the Vienna Convention on Diplomatic Relations." While some other members of the Security Council said that the sanctions don't impact on their embassies, Russia raised the issue on Tuesday at the end of a closed door meeting about the UNDOF mission. "The Secretary-General has learned that the leader of the Democratic People’s Republic of Korea, Kim Jong Il, passed away. The Secretary-General extends his sympathy to the people of the DPRK at this time of their national mourning. The Secretary-General reaffirms his commitment to peace and security on the Korean peninsula. 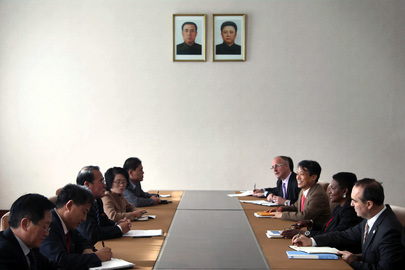 The United Nations system will continue to help the people of the DPRK. The Secretary-General is closely following the situation." Inner City Press: one more follow-up on this, has the Secretary-General made any phone calls? I know President [Barack] Obama spoke to President Lee [Myung-bak] of South Korea; has the Secretary-General, has he spoken to any regional leaders? Does he intend to do so? Associate Spokesperson Haq: Yes, I expect he does intend to do so. We will try to provide you some details of those phone calls as they take place. They haven’t taken place so far, but I expect that he will be in touch with people, as needed. But at the next day's noon briefing, no update on any calls was given by Ban's spokesman Martin Nesirky. Inner City Press is informed by Security Council members that Ban told them not only did Migiro sign the condolence book, but Ban is going to send a letter to the DPRK authorities. What will be in it? One wag joked about offering another Kim, Ban's senior adviser of five years, Kim Won-soo. But that of course was a joke, and there are said to be enough of those on this. Watch this site.